Now that Waiouru has been winded (turned around) Nick has been able to apply mastic to the starboard (right) side hatch. Nick doesn’t use a silicon sealer as over time it will apparently degrade and leak. He uses construction adhesive instead. It’s more of a glue and also more resilient. 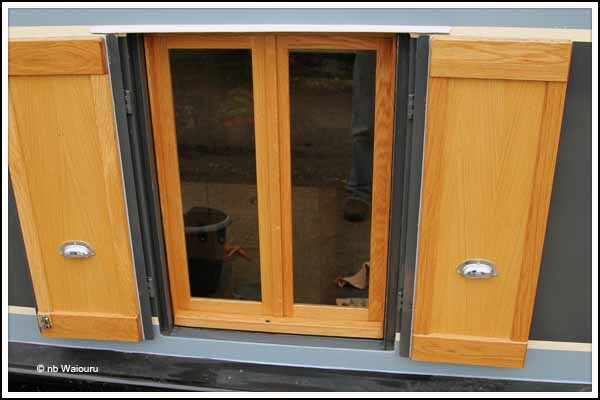 There are three separate areas in the side hatch which require sealing. The first is the interface between the interior timber door frame and the steel shell. The second is the external edge of the timber door liners on the exterior steel doors. The third is the join in the steel vertical gutters either side of the hatch opening. 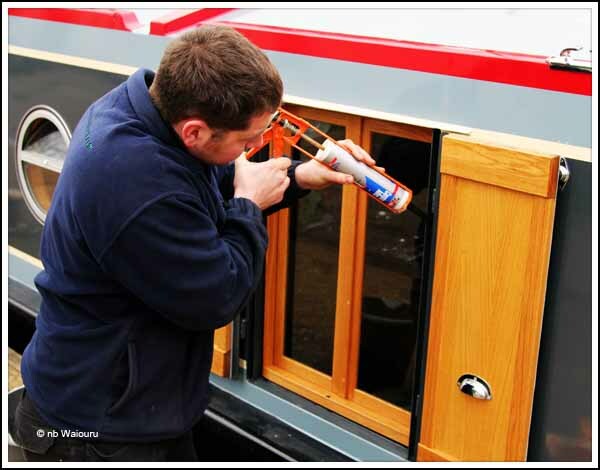 Darren had previously sealed around the outer edge of the starboard door liners using a light grey coloured construction adhesive. This will minimise the opportunity for moisture to migrate between the timber liner and the steel door. Getting moisture into here would cause the timber to swell, blacken and eventually rot. 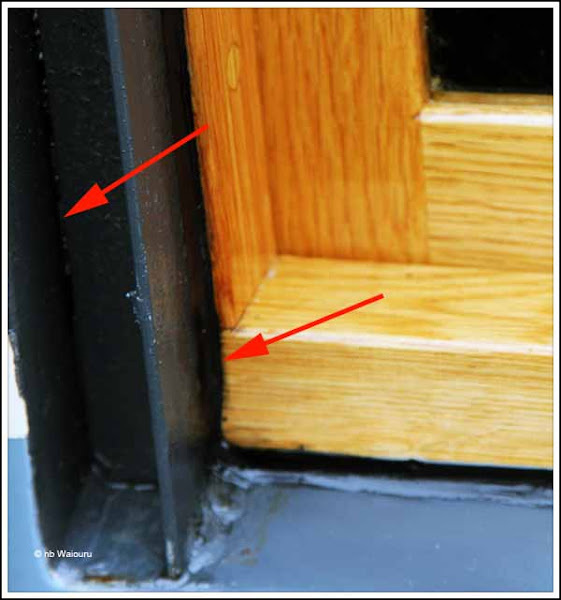 Nick ran a bead of adhesive around the entire timber door frame (right arrow below). The vertical steel gutter (left arrow in the photo above) channels water away from the door frame. However it’s made of 90° angle iron which has been tack welded to the main portion of the shell. 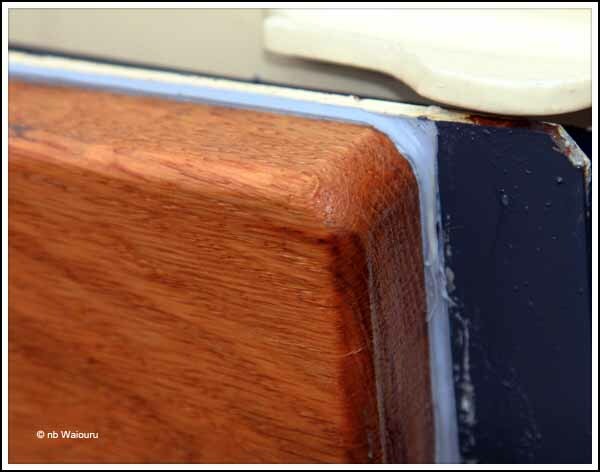 Consequentially water can leak into the boat through the gaps between the tack welds. To prevent this occurring Nick has run a vertical bead of construction adhesive down the join. Once Nick has applied all the adhesive he creates a smooth finish by him dipping the end of his finger in white spirits and running it down the bead. Any surplus adhesive is then wiped off his finger onto an old rag. The starboard side-hatch has now been fully sealed. Nick then realised Darren hadn’t sealed the door liners on the port side, so we will have to wind Waiouru yet again to enable them to be completed. There’s also some final painting to be done around the side hatch frames. Love reading about your build guys, read your blog since you were having problems with the boat builder. Hopefully you can enjoy our new blog too. We're actually getting our hatch redone tomorrow. I wanted to get the internal glazed doors done but due to the layout inside this isn't possible :( so will be having a piece of stained glass inside commissioned at some point which will slide in and out. Take care and who knows!? Or boats may pass at some point! Hi Lewis & Pawel. Thanks for leaving the comment. Always great to hear from readers. I've listed your blog on our blog roll but I must admit despite reading your blog from start to beginning I couldn't confirm your boat's name (is it really "One Thing After Another"?) and are your names displayed correctly? I think Jan is going to be very interested in following your cooking comments!